The AEM-7 is a twin-cab B-B electric locomotive that is used in the United States on the Northeast Corridor between Washington DC and Boston and the Keystone Corridor between Philadelphia and Harrisburg in Pennsylvania. They were built by Electro-Motive Division from 1978 to 1988. Budd. 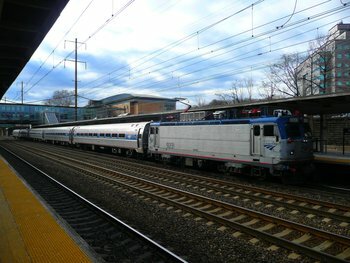 The same sounds would also be suitable for the ALP-44 locomotives owned by New Jersey Transit. life, little is heard above the humming sound of the blowers that run constantly - electrics are a lot quieter than diesels! also indebted to Bob Grosh and Fred Miller for their early work in deciphering the SDF language and engineering new functions. Some engine sound recordings by Alex Stroshane, copyright 2006, recorded in Boston, MA and Wilmington, DE.